Saying that a proposed Mexican-American studies textbook is "dripping with racism and intolerance," a group of educators and students is calling for the State Board of Education to reject the controversial book. Saying that a proposed Mexican-American studies textbook is "dripping with racism and intolerance," several educators and students are calling for the State Board of Education to reject the controversial book. “It is an utter shame we must deal with racially offensive academic work,” State Board member Ruben Cortez Jr., D-Brownsville, said Tuesday at a news conference in Brownsville announcing that a committee he convened had produced a 54-page report citing inaccuracies in the proposed "Mexican American Heritage" textbook. He said the textbook describes Mexicans as people who don’t value hard work and who only bring crimes and drugs into the country. According to the committee's report, one passage said, "Stereotypically, Mexicans were viewed as lazy compared to European or American workers ... It was also traditional to skip work on Mondays, and drinking on the job could be a problem." Cortez convened the ad hoc committee — which includes professors and high school teachers — to examine the book being considered for use in Mexican-American studies classes for Texas high school students. A public hearing over the proposed textbook is set for next Tuesday in Austin, and members of the committee will present their report then. Educators who spoke at Tuesday's news conference — held at Paredes Elementary School, which is named after Brownsville native and Mexican-American scholar Américo Paredes — said it would be irresponsible to support the textbook. “It was very difficult to get through it because of the significant errors that kept popping up,” he said. He cited passages in the textbook he claimed to be "anti-Catholic" because it paints a picture of loyalty only to the Pope. The report compared the textbook to a book by Samuel P. Huntington, which claims that Mexican immigration, culture and religion is a threat to the country. 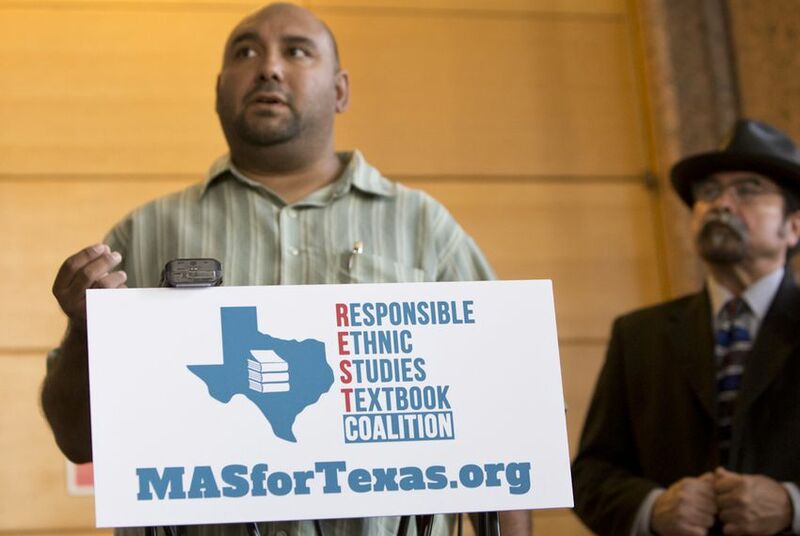 Christopher Carmona, assistant professor at the University of Texas-Rio Grande Valley, said at the news conference that he was appalled by how "blatantly racist" the textbook is. Carmona pointed to one discussion question in the textbook that asks, "Are Chicano Studies beneficial to Mexican-American culture? Explain." He said the question leads students to question the validity of Mexican-American studies. Most board members have said they intend to hear further debate before making a decision on how to vote. Board member David Bradley, R-Beaumont, said he thinks the state needs to focus on preparing students for college before adding courses such as Mexican-American studies. He also believes many school districts with a limited schedule and budget will not be able to add the optional course into their curriculum. Bradley also said he thinks the course is discriminatory toward other ethnic groups. If factual inaccuracies in the textbook are found, the publisher will have a chance to respond to those claims and correct the errors if they are found to be true. Bradley said he hopes the public will bring forward specific errors in the textbook rather than just emotional claims. Regardless of whether the book is approved by the board, school districts may still select their own textbooks and materials under state law as long as they can prove it aligns with the state's curriculum. Cortez said he will fight the textbook at the State Board of Education meeting next Tuesday, where the board is set to hear public comments on the adoption of the textbook. He called on the board to reopen bids for a new Mexican-American studies textbook and reject the current proposal. “[The textbook] offers one thing: hate. Hate toward Mexican-Americans,” Cortez said. Activist groups and professors gathered at the Texas Education Agency to list their concerns with a proposed Mexican American studies textbook and call on the board to reject it. Candidates running for the State Board of Education included a Republican who once claimed President Obama used to be a prostitute and a Democrat who described herself as a “MeXicana Empowerment Specialist."